In the new video series “Sports Parents Success Tips,” Dr. Patrick Cohn answers your youth sports psychology and mental training questions that deal with sports parents and the mental game challenges their sports kids have. What are some of the challenges that athletes have before games and getting ready for game? Watch the video below, Sports Parents Success Video 5: Pregame Mental Preparation, to see what tips Dr. Cohn gives to sports parents to help their young athletes mentally prepare before games. Sports Parents’ Top Dilemma: Helping Young Athletes Kick Perfectionism And Fear of Failure will walk you through the problem and arm you with practical solutions. A 23 page E-book that identifies the challenge, explains why it is harmful to young athletes and gives step-by-stop sports psychology tips for helping kids. A 21 page kids’ sports psychology workbook that is intended to help you kids identify beliefs and expectations that are the root of perfectionism. Now you can learn how to help young athletes overcome the difficult cycle of perfectionism, fear of failure and loss of confidence! Help Your Young Athletes Overcome Self-Doubt In Sports! 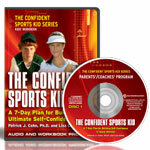 The Confident Sports Kid helps young athletes improve confidence quickly and overcome common confidence killers that destroy motivation and fun in sports! This is a 7-day program for sports parents and kids to boost young athletes’ performance, happiness and success… in sports and life! The Confident Sports Kid program is actually two programs: one that teaches sports parents how to boost their kids’ confidence, and another that teaches young athletes age 8 to 12 how to improve their self talk, avoid negative thinking, overcome expectations that limit confidence, and much more. What are parents and coaches saying?